I did the 5k the day before the marathon to use as a shakeout run and it was a great idea. I did really want to push hard and race, but kept patient and my pace never went below a 9:30 min/mi. My mom & grandmother also signed up to do the 5k, so it was a lot of fun to travel there all together! There were A LOT of corrals for the 5k and honestly, I didn't think it was organized so well. I overheard runners around me saying that they had 'no clue' (...or worse- they were planning on walking) what their finish time would be, but they were starting in the same corral as me! I did expect some congestion during this 5k and wasn't overly worried about it since I was just using it as some shakeout miles. If I were racing, I would have been in a faster corral (most likely) and probably wouldn't have needed to worry about the placing. This was my FIFTH marathon and my favorite (so far). 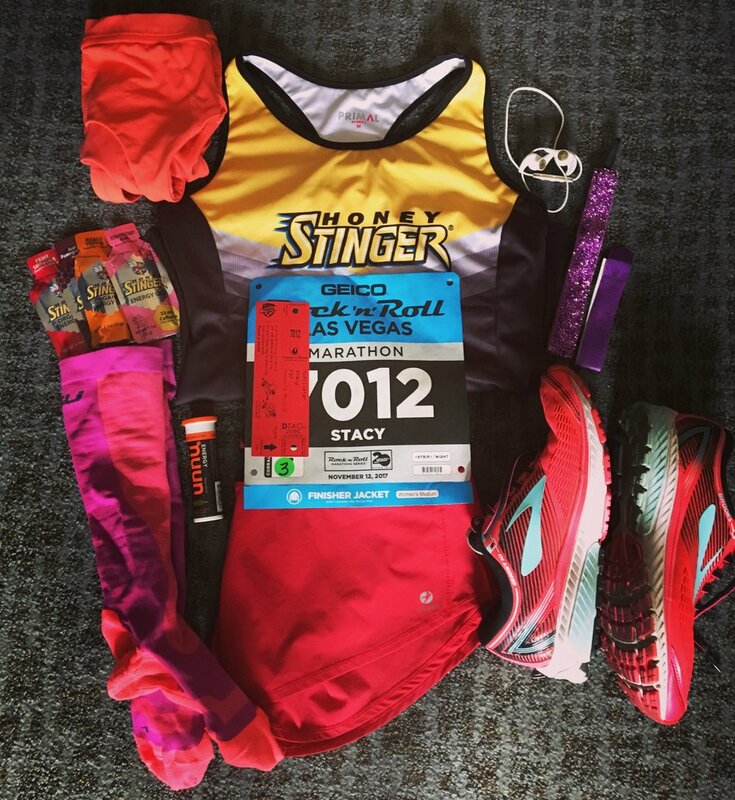 I did the Las Vegas Rock 'n Roll Marathon in 2016 (did the half) and had so much fun that I actually took advantage of their pre-race entry and signed up for the marathon (I really realllly wanted that marathon finisher jacket). I followed the Hanson's Marathon Method (you can find my weekly training rundowns and training review on the blog HERE ) and felt SO prepared for this race. Since the race doesn't start until 4:30pm, I had enough time in the morning to braid my hair, prepare my race playlist, foam roll, carbo-load with some bagels, drink lots of electrolytes/water, and put my legs up the wall. We stayed at the Excalibur (because it's so close to the start line and within a mile of the finish), so we didn't have to leave our room until 3:15 to head to the start area festivities! 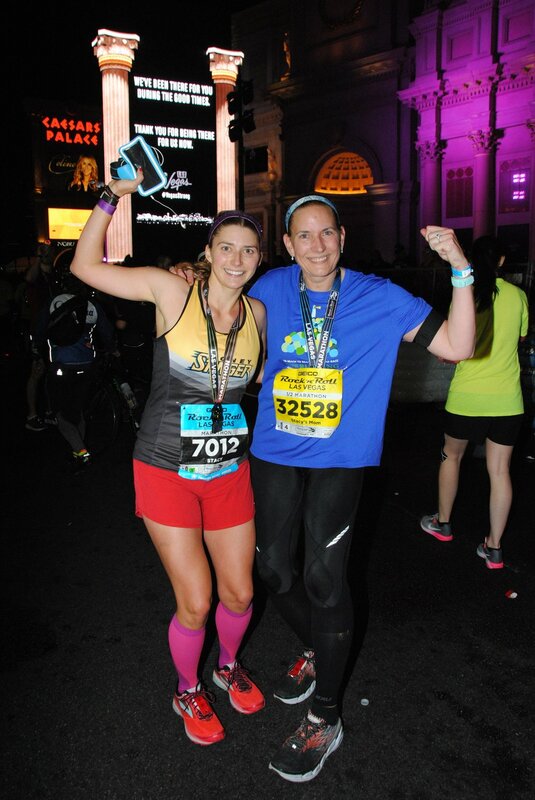 Because of the horrendous #VegasStrong events that occurred, the start line was moved actually closer to our hotel and we were able to use the REAL bathrooms just inside of New York New York. They had ample security set-up throughout the entire starting area, which made me feel really safe. I began in corral #4, but because of where the entrance to our Blue Corral start was, had to weave my way through other corrals to get to my start (definitely recommend getting into your corral 50+ minutes early)- which was really crazy considering I tried to get into my corral over 30 minutes prior to the start and it took me 15 minutes to weave my way up to Corral 4! In 2016 they had the blue start just for marathon runners (but they blended the two for this year), so hopefully they change it back because that was insane. It was also a wave start (NOT corral starts which I assumed it would be), so when the gun went off, everyone began running/ walking and it was just insane. It took me the first few miles just to weave through the crowds. Not so much fun. I decided I would break my run into time splits and focus on just the hour I was in, with an acronym for each hour ( 0-60 minutes- A-Attitude; 60-120 minutes- B-Believe; 120-180 minutes C-Conquer; 180-finish ABCs just keep repeating the mantra)- also wrote these ABCs on my arm. I was also planning on taking gels every 50 minutes (roughly every 5.75 miles), which doing the math for the gels really helped keep my mind off running! The marathon follows the half marathon course until mile 11, where we peel off from the half marathon and from that point, it was SO much nicer. I kept my music off until this point (actually kept it off until past mile 12) so I could really take in the strip and hold my pace back a bit and just experience it all. I really recommend doing this during your next race! The crowd support was incredible and energy is contagious. The course is also definitely downhill after the turnaround by the Welcome to Las Vegas sign (miles 3-8ish I believe), so I tried to net 5-10 seconds during this section. I was my fastest pace during this time until mile 25, around an 8:41 pace. At the point of the pull-off, the course opens up and becomes quieter as it heads into Downtown Las Vegas. I really enjoyed miles 11-15 for this point, but then I believe around mile 15 or so we hit a small hill and that was pretty difficult (one of two hills you'll encounter during this race). It didn't feel like they had as many bands through miles 11-24 where the marathoners are split from the half marathons, but I've never done a Rock 'n Roll Marathon before so maybe this is normal for these races. Thankfully I saved my music until these miles. Once I hit mile 17, we weaved through a parking lot where they had strobe lights (which hit me in the eyes a few times and blinded me..not so much fun). This part was the most challenging for me because it was a maze where you could kind-of see where you're running next, but couldn't see the end of the maze so mentally it was HARD. I tried to stay positive and focused on catching the runner in front of me. Around mile 18 they had salt packets (which was SO needed! ), I took one (I've never used salt before but this was perfect because I had been craving pretzels) and immediately started feeling better. I also took a gel (with caffeine) a bit earlier at this point because I started to feel slugglish. The gel kicked in and as we re-entered the strip around ~mile 23 (with the half marathoners), I started to look for my mom (who was running the half!). We had thought that we may finish around the same time, so I scanned the crowds and SAW HER! It was the most amazing boost to see her within a mile of finishing her second half and that really pushed me to the finish! We didn't stay with the half course for very long and began to be weaved through the staging area of the 5k the night before (again we were in a maze and could see where we were running throughout these two miles). It seemed like a lot of people began to bonk at this point because I started passing A LOT of people (or else was just so jazzed with seeing my mom and knowing that if I kept a decent clip, we could finish around the same time). I had been following this one girl from mile 18, but after mile 24 I hit my surge and passed her (THANK YOU to that girl who really helped pace me for those tough miles from 18-22). We wove back onto the strip for ~.25 miles and then were on the last stretch. I knew from looking at the map that this out-and-back was the final push and that after this, I only had less than a half mile to go. It was difficult to pick up my pace during this part before the turn around because it was uphill, but as soon as I passed that mile 25 marker I got SO excited! I even turned off my music and picked up my pace to 8:20 for that final 1.2 miles! I passed several runners on the home stretch along the strip and used the amazing energy from the crowd to dig deep and push it to the finish. I crossed the finish line and honestly felt like I still had more gas left! I do wish I had picked up the pace a bit before mile 25, but I was still SO HAPPY to cross that finish line in under 4 hours (in 3:55:33 to be exact! )- a goal that I had set for myself at the beginning of 2017. I looked over my shoulder to the half marathon finisher shoot and there was MY MOM! She had crossed the finish line exactly the same time that I did! I was SO HAPPY! We got our medals at the same time and seeing the notification of a 'new marathon time' come up on my Garmin was amazing. The finisher shoot is pretty long (~.4 miles) and the walk back to our hotel is really a struggle, but it's nice to stretch out your legs after the race. Overall, I LOVED every minute of this race and the runner's high is still going strong almost 2 weeks later. I love running and can't wait to set my next goal! I will definitely be back next year (and probably for another 26.2 miles!! ).